This birthday card, one of a group of 269, was given to and kept by Jennifer Leaver (née Davies). The cards were given to her by a range of relatives and friends and span from 1957 to1975 - the dates of her first to her eighteenth birthday. Jennifer was born in 1957 and the cards reflect progression of typography, imagery and graphic styles for birthday cards, spanning over three decades. The cards also reflect the changing and age appropriate imagery chosen by greetings card companies as well as the choices made by those who selected and sent the cards to Jennifer as she grew older. Some of the earlier younger cards commonly show childish scenes often including illustrated baby animal characters, whereas later cards reflect perceived changes of interest for a growing girl such as images of flowers, fashions and music. 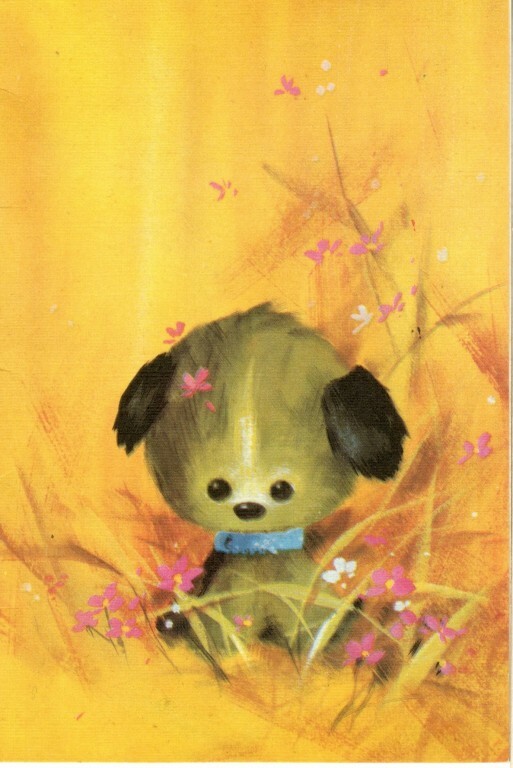 Colour printed card showing a dog or puppy with black ears, surrounded by pink flowers against a yellow background. Printed message in red inside the card. Handwritten message in blue ink inside the card. Printed on the back of the card near the bottom. One of 269 cards donated by Jennifer Leaver (née Davies) that have been given to her on her birthdays from 1-18 from family and friends. 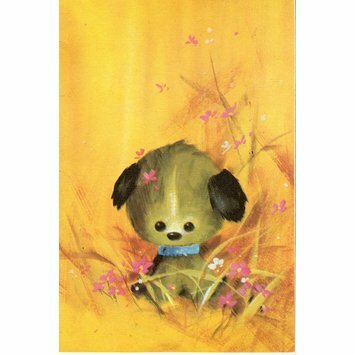 colour printed card with an illustration of a puppy against a yellow background, a Noel Tatt card, printed in England, 1968. Given to Jennifer Leaver (nee Davies) on her twelfth birthday.